The London Classic Bike Tour departs daily at 10.30 am (in English). During July and August there is an additional tour at 2.30 pm. Tours in other languages depart between 10 am and 10.30 am. Aim to visit during the Spring/Summer when there is less chance of rain. We are comparing London Highlights Bike Tour Prices from leading ticket suppliers and Try to find you Cheap tickets prices on the market. 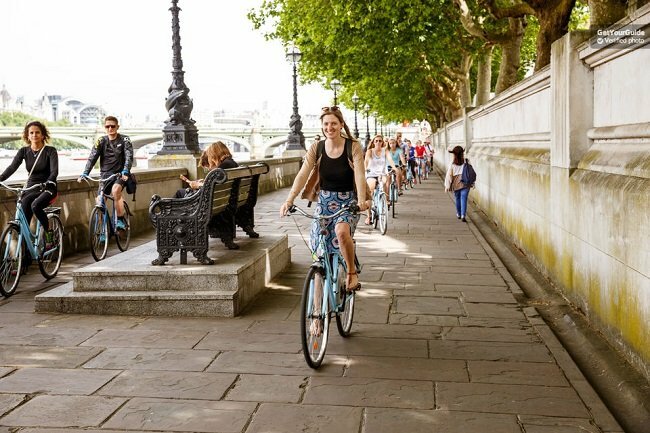 This is a 3-hour city bike tour which will introduce you to the most important landmarks of the British Capital. The city of London is popular with cyclists who prefer to peddle through the typical London traffic instead of squeezing into overcrowded buses and subway stations. As such the city is well equipped with cycle lanes and drivers are accustomed to sharing the road with cyclists. During the tour you’ll be led by an expert resident guide and enjoy a fully guided tour in your preferred language. While the tour does not allow time to enter any museums or attractions you will make stops in front of significant locations for photos and to hear your guide's commentary. Right for people who prefer a fun and active tour which is a little more fast paced than you usual walking tour. This is great for people who want to see a lot of Central London in a short period of time. Participants must be able to ride a bike independently and feel confident cycling on busy roads, however the route is mostly flat so only a moderate level of fitness is needed. Suitable for children over the age of 10 and for fun for adults too. Your Experience With London Highlights Bike Tour? Pick up your bike and start exploring the city centre of London on a small group bike tour. Admire the beautiful London architecture, gaze up to the impressive Dome of St Pauls Cathedral, and take in the façade of the Lambeth Palace. Let your guide tell you the ins and outs of the British Government whilst standing outside of the Houses of Parliament. Browse the street stalls and independent stores in Smithfield’s and Leather Lane Markets. See major city landmarks including the London Eye, Nelson’s Column, Buckingham Palace and Westminster Abbey. Cycle through the scenic gardens of St James Parks and end your tour on Blackfriars Bridges. What London Highlights Bike Tour Includes? 3-hour tour of Central London by bicycle. Use of bicycle and helmet. Sights You Will See During This Tour. If English is not your native language then you can opt to take the tour in one of the 6 other languages. Tours in all languages are available daily. Travelers Reviews about London Highlights Bike Tour? On reputable travel websites, such as TripAdvisor and Viator, the London Classic Bike Tour had a positive 4.5 out of 5 overall rating. On Get Your Guide the 3-hour tour has an even higher average score of 4.8 out of 5. People who have participated in this tour have said that this is a fantastic way to see and understand the historic city of London. Comments also recommend the tour guides who are ‘knowledgeable’ and ‘true performers’. Some reviews also indicate that the length and difficulty of this tour is suitable for children. Not suitable for wheelchair users or for people with mobility difficulties. Your ticket purchase will be confirmed and the confirmation sent to you via email at the time of booking. You will need to bring a printed ticket or an e-ticket to show your tour guide. Specific cancellation policies depend on individual ticket suppliers and refund policies also vary. In some cases you will be allowed to cancel and receive a full refund up to a number of days in advance however some providers will charge a cancellation fee. Some tickets may be non-refundable so please check the cancellation policy. The London Classic Bicycle Tour is available in 7 languages: English, French, Spanish, Italian, German, Dutch, and Japanese. Children under the age of 10 are not permitted to join the tour. A minimum group size applies; if there are fewer than two participants then the tour will be cancelled, in this case, you will have the option to join the bike tour on a different day or to refund your ticket. The company also offer a private version of this tour which is recommended for larger groups or families. Meeting Point: got to the office of The London Bicycle Tour Company. Address:1a Gabriels Wharf, 56 Upper Ground, London, SE1 9PP.